Quick assembly and flexible design. For events, festivals, or to enhance existing stores. The 360-degree surface can be fully branded. bboxx ATM 2 ATMs is the classic among the bboxx cash machine models. This mobile bboxx cash machine can be set up in 20 Minutes. 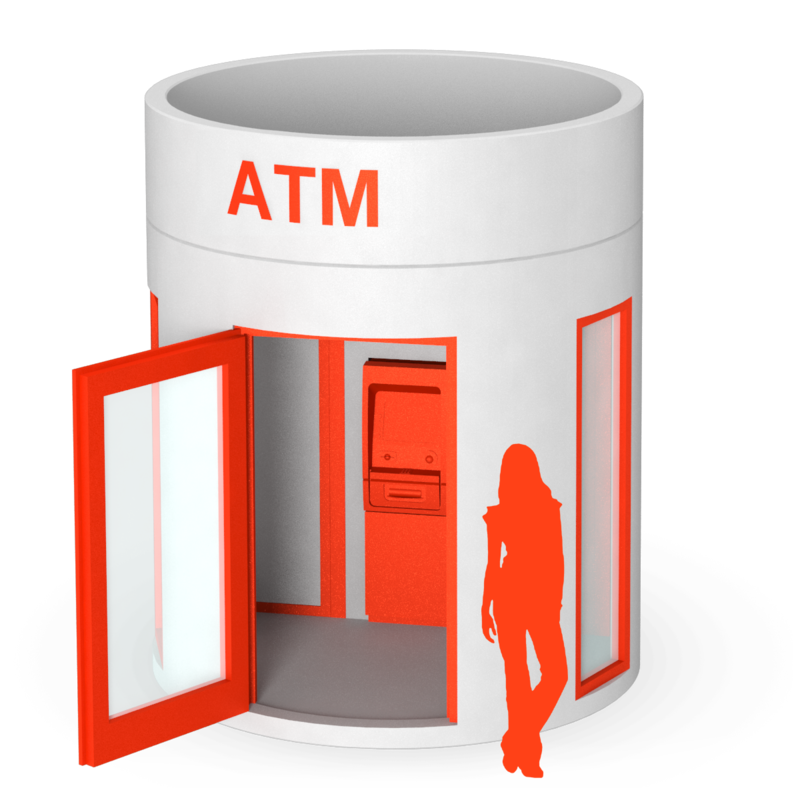 In this solution with two ATMs on the inside, the access is weather-protected. A lockable anteroom protects clients and cash-in-transit drivers when they access the ATMs. Prices are quoted ex-works, excluding German VAT. Request an individual purchase or rental price. 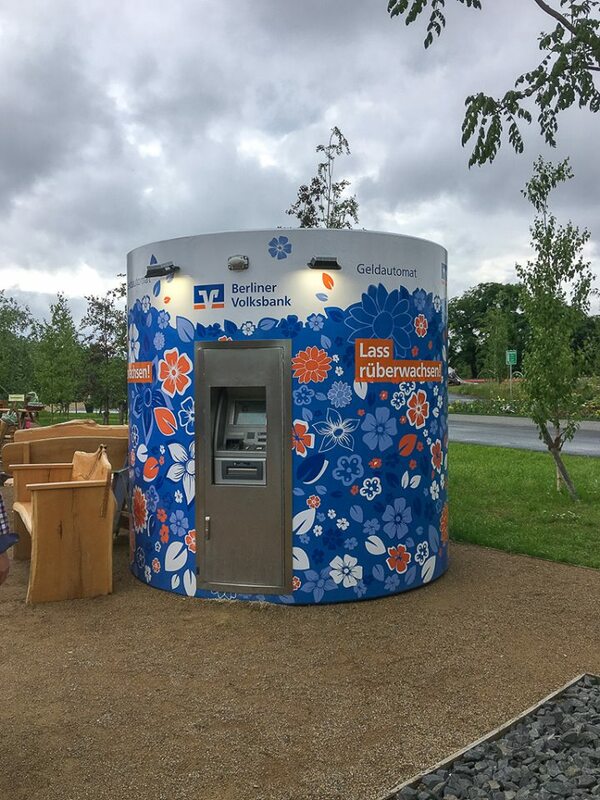 bboxx ATM for Berliner Volksbank with particularly flowery design. This model provides protection with a lockable anteroom, and access via a ramp with handrail. The bboxx mobile ATMs can be combined with other bboxx models, such as the bboxx Box office. With graffitti design on the outside surface, the bboxx mobile ATM is even more striking. During the rehabilitation of the Berlin State Opera on Unter den Linden, Veloform provided with twin solution. Der bboxx Geldautomat auf dem Münchner Oktoberfest. 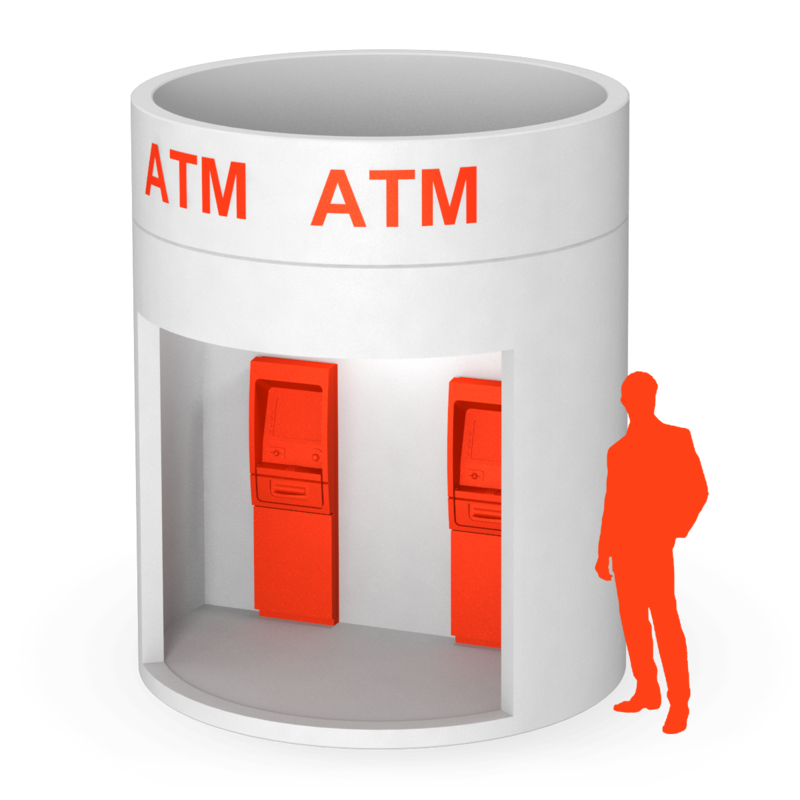 bboxx ATM is a round, transportable pavillion for ATMs and vending machines. 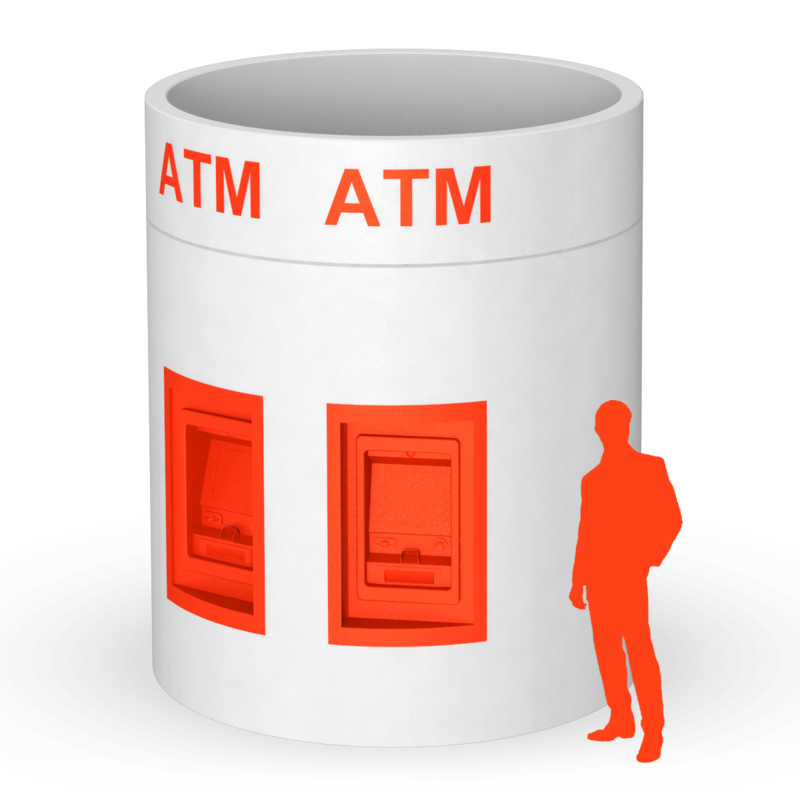 Cash, drinks, snacks or gold are safe inside this solid pod. The bboxx is weather-proof, and cannot be missed because of its striking look. The promotional effect of the mobile structure made of concrete steel is provided by the 360-degree advertising surface that can be branded in all colours, with both finish and stickers. Another plus: the design of the interior space and the size and number of window openings are flexible. Up to two cash machines kann be integrated in the bboxx mobile ATM. 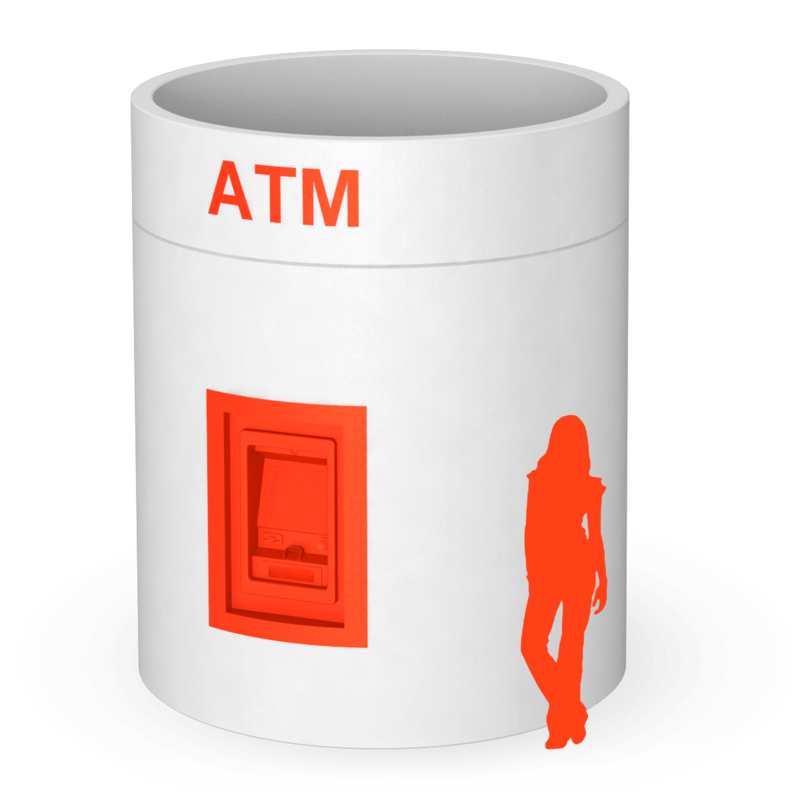 Make sure your ATM or vending machine is present at the next festival or near prestigious urban construction sites, where no other ATMs and vending machines can be installed.